New book, 80 pages, SS14036. Sea power in the 21st Century is rapidly taking on a new look, vastly different from the massive and ponderous navies of the past. Littoral combat ships or LCSs are a class of small surface vessels that are meant to operate in coastal areas where they can neutralize the many fluid localized threats that are so characteristic of the modern age. Designed for deployment in place of the destroyer or cruiser, the LCS was envisaged by the Navy as a networked, agile, stealthy surface combatant capable of defeating anti-access and asymmetric threats in the littorals. The U.S. Navy operates two basic classes of LCS: the Freedom class and the Independence class, the latter being characteristically a trimaran. In keeping with the basic LCS concept, crew size, like the size of the vessel itself, is to be small. Deployments will thus involve 50-percent fewer ships and 25-percent smaller crews than previously, the technical sophistication, versatility, and speed of the LCS is to more than make up for the difference in quantity. LCS versatility partly consists in the vessel’s ability to be reconfigured for different duties and roles by changing mission modules. Mission modules consist of weapon systems, sensors, etc., that are designed for specific types of task. Specific personnel will accompany relevant modules. Modules have been designed for anti-submarine warfare (ASW), mine hunting (MCM), surface warfare (SUW) and special warfare missions. 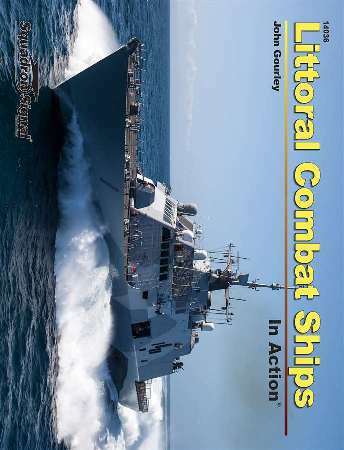 Littoral Combat Ships in Action puts you inside these cutting-edge fighting ships and introduces their various configurations and their modern weapons systems. Packed with more than 250 photographs.